Celebrate the holiday season with a tour of the Boyhood Home of President Woodrow Wilson, a National Historic Landmark. Enjoy the house decorated for the holidays with fresh evergreens and festive decorations! December tours of the Boyhood Home of President Woodrow Wilson will incorporate details about what Christmas was like in 1918, at the end of World War I. Guided day tours are offered Thursdays-Saturdays on the hour from 10:00 – 4:00 pm. The Wilson House is a great place to bring out of town guests! Invite a friend to join you for a day of downtown shopping, touring and lunch! 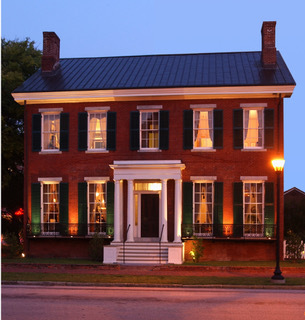 Admission to the Wilson House is $5 for adults, $4 for seniors, and $3 for students K-12. Children 5 and under are free. Special Candlelight Tours will take place on Friday, November 30 and Saturday, December 1 from 5:00 – 7:00 pm, with tours offered every 30 minutes. 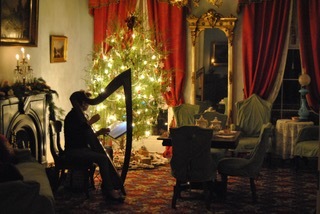 Enjoy festive refreshments with the lights turned down low, the candles flickering, and live music filling the house with holiday cheer from long ago. Candlelight Tour admission is $10 for adults, $5 for students ages 5-18, or free for children under age five. Click here to purchase reservations in advance. For more information, contact Historic Augusta at 706-724-0436 or visit www.wilsonboyhoodhome.org. The Wilson House is located at 419 Seventh Street in downtown Augusta, Georgia.